The Evolution of Music Storage was an assignment from my Visual Aesthetics course at Elon University. The assignment was to create a static information design graphic—a single “page” image—that will communicate a technological topic in a manner that is simple, direct, and easy to understand. It had to incorporate a combination of visual graphics, icons, data graphics, and images. This was one of my favorite projects of the semester. I explored three adjectives throughout my initial rough sketching process. The illustrations, and the cloud worked well together, and I wanted to generate a modern approach to old and new technologies. 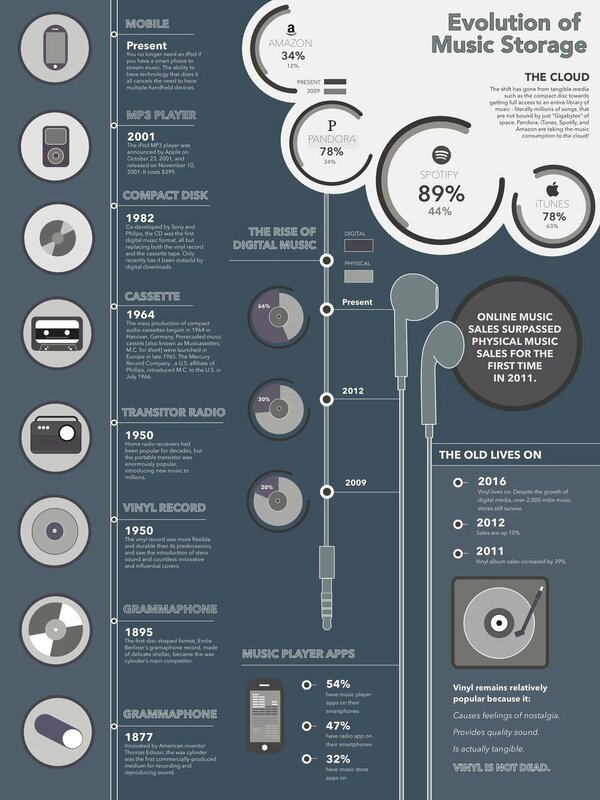 I also wanted to incorporate the fact that the old always cycles back to new forms becoming popular again, and the trends in online digital music.